Rocky Mountain Naturalists, Pictured at from L to R: Tara Szkorupa, RMN Vice President, Peter Davidson, RMN President, Brett Yeats, BC Parks representative and Greg Ross, RMN Director BC Nature. 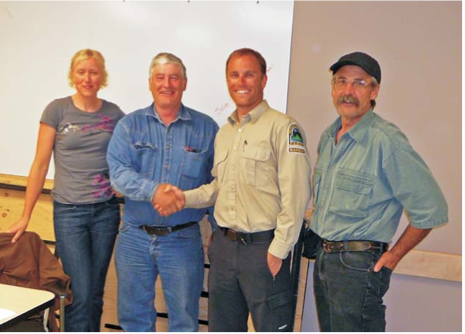 The Rocky Mountain Naturalists, a Cranbrook/ Kimberly naturalist group, have entered into a “Stewardship Partnership Agreement” with the Ministry of Environment (Parks). The Rocky Mountain Naturalists will be taking on the role of ER Wardens for four Ecological Reserves in the East Kootenays. The Four ERs are Columbia Lake, Mount Sabine, Ram Creek and Gilnockie.